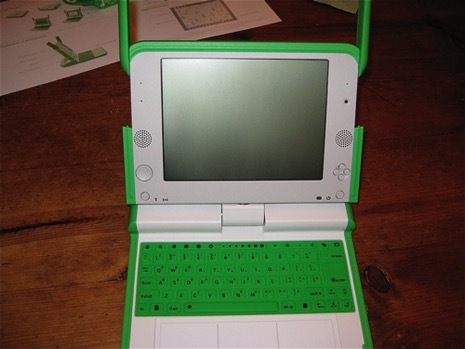 My OLPC XO arrived today! I managed to pry it from the kids when they went to bed and started mucking around with it. It's a little slower than I was expecting (not that I was expecting it to be swift or anything), and the soft keyboard takes a little getting used to, but on the whole I'm liking it. The industrial design is great in my opinion, and has some neat little touch: the texturing in the case has large nobbles, and around the handle the nobbles become Xs, so that the texturing repeats the XO logo. The Sugar UI feels good and the included apps, a.k.a. Activities, provide a good cross section of functionality, from word processing to recording video on the built-in camera. The browser, which is Firefox derived, works well and even has some Flash support (via Gnash). It also has some integration with Sugar, since when I went to upload a photo to Flickr and hit the Browse button, a popup appeared showing my last few activities, including the picture I had taken. When I clicked on it, it inserted a /tmp path to a JPEG file into the form. Alas, when I hit the Ok button Flickr told me that the file was empty. I popped into the shell and could the file in question was indeed empty, but there was a non-empty JPG also in temp. I copied it to the path the browser was pointing at (I couldn't get it to let me edit he path in the browser for some reason), and this time the upload worked. I'm sure that's either just a kink or something I didn't do properly when saving the photo. The Neighborhood page in Sugar showed my home wireless network's SSID, but I couldn't figure out how to connect to it. I have since found out that you just need to click on the dot representing the network, but I expected there to be a "Connect..." option in the popup dialog that appears when you hover the mouse over the dot. 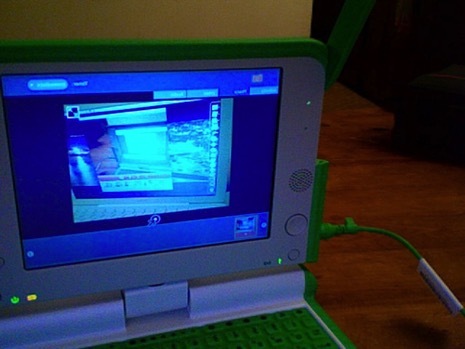 In any case I use WPA and, at least according to the OLPC "getting connected" page, "we do not support WPA-enabled WiFi access points; we anticipate including WPA support in early 2008." 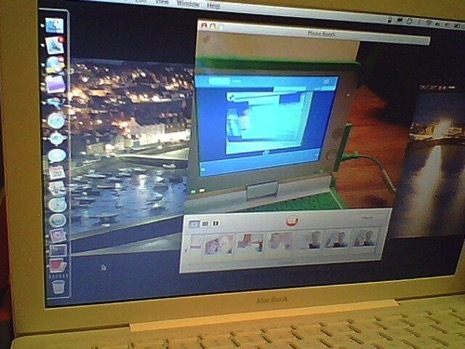 However, I did some googling and found that I could drop to the shell to get WPA working (see http://wiki.laptop.org/go/WPA_Manual_Setting). I created the script suggested, ran it, and rebooted the XO, and it came up on my WPA network. which can measure the distance between two laptops by measuring the length of time it takes for sound to travel between them, but since it requires 2 XOs, it'll have to wait until we both can get them into the office after the holidays. For more photos of the XO, see the unboxing set I put on Flickr.